Belle maison en pierre française provençal dans le jardin privé indigène surplombant la plage de Llandudno. Le chalet a été soigneusement construit avec une attention exceptionnelle aux détails, y compris les sols en pierre, hauts plafonds avec poutres apparentes, luminaires anciens, Français travail en fer forgé et des volets en bois. Il comprend une chambre double avec des portes-fenêtres donnant sur le patio de gravier privé avec vue sur la mer et la montagne et table d'hôtes ombre par de grands proteas, salle de bains avec baignoire et douche carrelée en travertin (également vue sur la montagne! ), Salon avec coin cuisine et couvert "sundowner" patio avec une vue magnifique sur la mer. Le salon et une kitchenette sont entièrement équipées d'une télévision, d'un réfrigérateur, micro-ondes convection, brûleurs à gaz, lave-linge, lave-vaisselle, bouilloire grille-pain, machine à café nespresso etc. Il y a une table en pierre et des chaises sur la terrasse où vous pourrez siroter vos cocktails au coucher du soleil, ainsi que des chaises longues pour profiter du soleil de l'après-midi tout en donnant sur l'océan. La chambre joliment meublée comprend un lit king-size avec couette en duvet, lin ancien français et couette en coton. Le chalet est entouré d'un magnifique jardin planté de plantes indigènes ainsi qu'un assortiment d'herbes de cuisine, que vous êtes encouragés à utiliser. Les clients sont invités à utiliser les grands transats de la piscine et la piscine situés à côté du chalet. Nous avons également accès à de squash et de tennis ainsi qu'un 300m école de yoga situé dans le chalet. La plage est de ± - 5min à pied. Situé dans l'enclave spectaculaire de Llandudno qui se trouve sur la côte atlantique entre Camps Bay et Hout Bay. plage de Llandudno avec ses fines de sable blanc et de curling vagues de surf est l'une des plus belles de Cape Town, mais en raison du stationnement limité est conservé intact et utilisé principalement par les habitants. Commerces et restaurants sont un 5min en voiture et Table Mountain 10min, V & A; Waterfront 25min, Constantia Winelands 20min et Cape Point 35min. Les couchers de soleil sur l'océan Atlantique vues depuis le patio de chalet sont spectaculaires. This accommodation is private and well serviced (daily). It came well-equipped with everything you could require in a two week stay. Comfortable bedroom, living room, bathroom and outdoor sitting area. We really enjoyed our stay in beautiful Llandudno. Llandudno is gorgeous and so is this cottage. It was the perfect size, was extremely clean and comfortable, and Vicky was a perfect host. She was responsive to any and all questions and requests, and was so helpful with advice for newcomers to Cape Town. If we get to go back, which we totally plan to, we would love to use this cottage again. The beach nearby, just a short walk down a beautiful path, is like something from a movie. Everyone there was friendly, and we met several very nice locals. Can’t wait to go back. Thank you so much for this lovely review and we would love to have you back some time in the future! The cottage is small but very comfortable for two people. Lovely views, and only a short walk to the beach. We mostly ate out in the evenings but the kitchen although small is reasonably equipped . Very helpful host. We enjoyed our stay.very much. Petit Paradis is a delightful cottage set in a charming garden with a real French provencale character.There are lovely views over the sea and it is just a few hundred yards from the beach. A wonderful place to relax in beautiful South Africa. When you are tired of relaxing there are plenty of world class restaurants and vineyards a short drive away. Vicky is an excellent host and the cottage is in great condition and well maintained and serviced by her friendly staff who are always on hand. Petit Paradis is one of those magical places you immediately feel at home and most importantly relaxed. The gardens surrounding the cottage are beautiful and the cottage itself warm and inviting. The location is perfect for watching the sunset from the patio and the beach itself is so close if you prefer to watch the sunset from there. Vicky was welcoming when I arrived and the lovely flowers she left in each room was such a lovely touch. I highly recommend Petit Paradis and will definitely be returning. Thanks for the lovely review ! We would love to have you back as our guest in the near future! Gorgeous, elegant, water-view stone cottage! 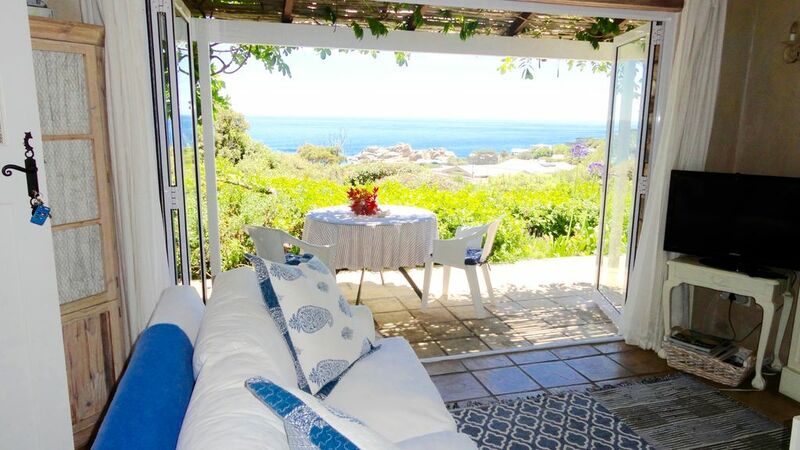 Llandudno is one of Cape Town’s most beautiful beach suburbs and our little haven, Petit Paradis, is a Provencal-esque stone cottage set in fragrant native gardens. Wisteria, bougainvillea, Cape honeysuckle, native fynbos, lavender, olive and lemon trees attract charming native birds. Nestled in a valley with views towards the Twelve Apostles, Camps Bay, Little Lion’s Head and Karbonkelberg, exclusive Llandudno is named for its Welsh counterpart. Petit Paradis, set in its private garden out of sight of the main house, yet securely behind gates, has sea and mountain views from every window, French-inspired interiors of cream, peach, and pale blues with white calico and wood furnishings, plus underfloor heating and a gas fire for those chilly nights. Vicky has thought of everything including excellent coffee and wine, to make our stay perfect. How lovely it is to sit on the patio watching the sun go down while your dinner cooks on the barbecue. We even spot whales in the bay. On hot days, we stretch out on the sun loungers with the sea glinting below, and listen to the tiny birds chirping in the gorgeous garden. The deep bath has views up to the mountain, while from the comfortable bed, French doors open onto the garden. It’s only a five-minute walk to the beach and owners Vicky and Graham, who live discreetly on the property, often walk there with a sunset bottle of champagne, though the sunset is equally exquisite from the cottage’s stone patio. It’s hard to get a booking for this one – European and English visitors flock here – but if you can, it’s worth it. Not only have we booked to stay again this year, but we would actually like to move in and live there!